Ancestry.com sent me an email with new hints for ancestors among the Texas death certificates. Amid this information, I learned the supposed birthplace of my 2G-grandfather, Anson G. Bennett — Warsaw, Mo. I say “supposed,” because Anson obviously wasn’t there to verify the information. I haven’t done a lot of research on my Bennett line — this gives me a new lead to work from. I spent Thanksgiving at my Aunt Dorrie’s house. My bed was next to a bookcase filled with many family photos. There I saw a photo I barely recognized from when it sat in my grandma’s apartment. 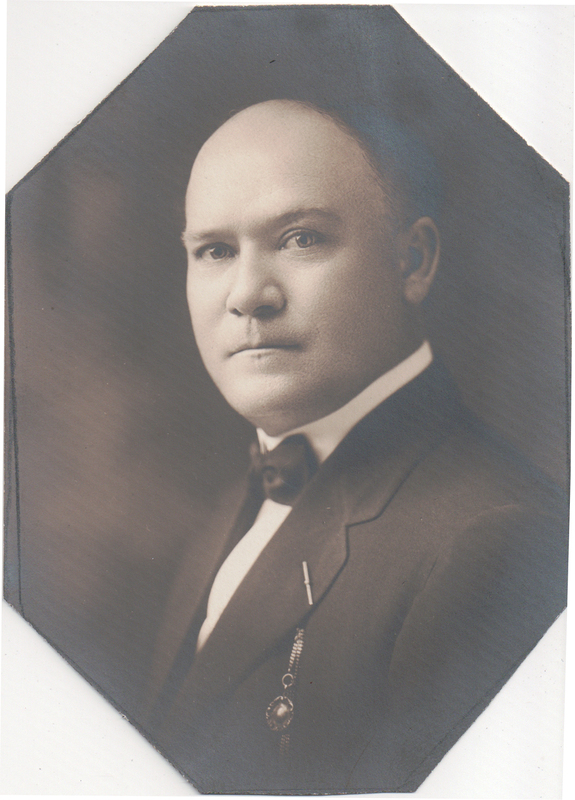 I never realized who it was when I was little, but my aunt confirmed that it was my great-grandfather, Herman Wild. Fortunately, I had brought my Flip-Pal scanner with me and scanned the above along with several other photos. Herman, about whom I have blogged before, was the son of Fridolin Wild (of Germany) and Lena Hoyer. The family lived in San Antonio, Texas. He married Susan Campbell Bennett and their son Herman Bennett Wild was my grandfather. Another genealogical discovery (for me) over the holiday was that I got to see a stein my aunt has that is engraved with Herman’s sister’s name, Josefa Wild. My aunt didn’t even realize that it was a family heirloom until several years after she received it from my grandmother. This weekend, one of my aunts and I went through a ton of photos and documents that used to belong to my grandmother. 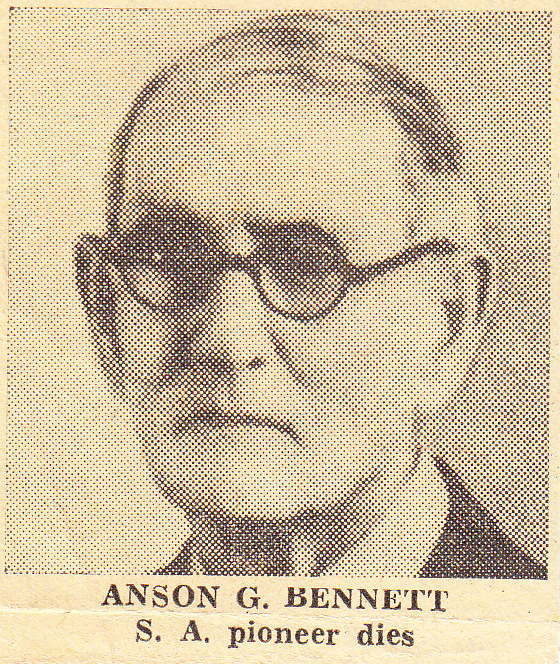 Among the treasures was a funeral announcement for my second great-grandfather, Anson G. Bennett. I wrote about him briefly before. One of the most exciting things about the article was the photo shown here — I’d never seen his photo before. Unfortunately, the newspaper clipping isn’t dated or identified by publication name. It most likely came from one of the San Antonio papers. The article reveals several new-to-me facts. One of Anson’s sons was San Antonio city clerk. Anson was buried at St. Mary’s parish cemetery. 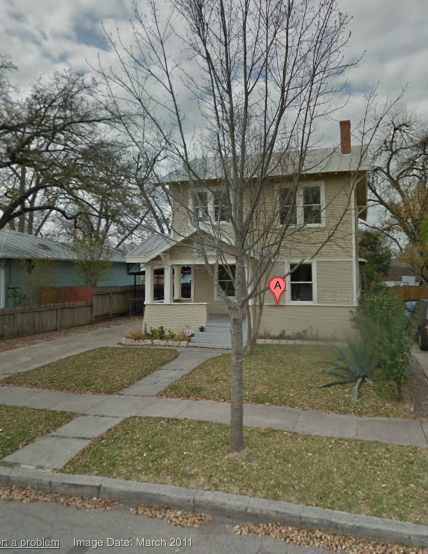 Anson’s address at the time of his death was 619 Cedar Street. I already knew that Anson died on 12 Mar 1944. I didn’t know about his father’s Civil War service. I believe he served the Confederacy as I have evidence he was a slave owner (an obituary for one of the family’s slaves was even published in the San Antonio Express). Beyond the above clues, searching anew for information on Anson led me to his listing in the 1940 census. I also found another newspaper article that said Samuel C. Bennett was custodian of the Alamo for three years prior to his death in 1900 (“Capt. Bennett Dead,” Dallas Morning News, 16 Jan 1900, digital image, GenealogyBank, http://genealogybank.com : accessed 2 Sep 2012.). I have a feeling there’s going to be a lot more material to find on him.